This is the pure electric version, which gets a 28 kWh (net) battery pack which is capable of 0-80% rapid charge in 33 minutes. Hyundai has picked the European specification for rapid charging, which means that you get a CCS socket. Drive is provided by a 118 bhp electric motor which powers the front wheels. Thanks to a healthy 218 lb ft of torque, 0-62 mph is dispatched in under 10 seconds. Encouragingly Hyundai has aimed to produce an electric car that you will want to drive; high strength steel (53% of body), aluminium bonnet, tailgate and suspension, and a low centre of gravity all help to make the case. However to fit the batteries in, the Hybrid’s independent rear suspension is ditched in favour of a less sophisticated torsion beam set up. So is it fun? The first surprise is that despite the rear suspension, the electric IONIQ is more engaging to drive than the Hybrid. The second surprise is that it isn’t just more fun, it is actually fun! Body control is good, there is a useful amount of grip and the balance is neutral. Aided by the instant torque, a Sport setting and a 4 stage regenerative braking system controlled by paddles behind the wheel, it makes a fun companion when the road gets interesting. 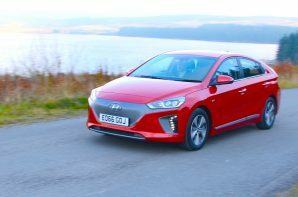 The electric IONIQ has a good, if not class leading range, is keenly priced, good to drive, has uncontroversial looks and the reassurance of Hyundai’s 5 year warranty (8 year battery). You do loose some boot space but with 350 litres remaining it is a practical family hatch which delivers driver engagement and zero local emissions. Well done Hyundai.